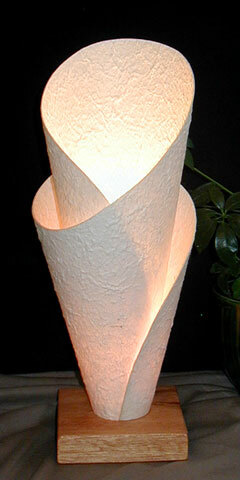 A graceful twisting and twirling of sturdy lamp shade paper forms a beautiful flower-like shape in this unique and elegant table lamp. Available in other paper colors by request. Solid wood base. 16" tall and 6" at widest point. Holds one candelabra bulb max. 25 watts.